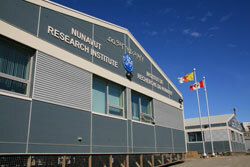 In 2010 the Nunavut Research Institute (NRI) received 11 million dollars through the Government of Canada’s Arctic Research Infrastructure Fund (ARIF) to replace and expand the NRI research facilities, greatly expanding the range and quality of services and support we can offer to researchers. The new NRI research complex in Iqaluit consists of two state of the art buildings (each approximately 5000 square feet). 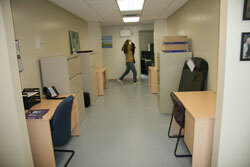 One housing NRI’s administrative offices, research laboratory, meeting areas, and conference rooms. The adjoining building houses the classrooms, teachers’ offices, and teaching laboratories of Nunavut Arctic College’s Environmental Technology Program, along with the Institute’s new research library. Both buildings were specifically designed to meet the practical needs of researchers and incorporate innovative energy efficiency design features. 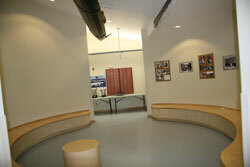 Construction of the buildings was completed in December 2010, and the buildings were occupied in February 2011. 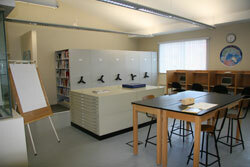 To book use of the facilities early contact NRI’s manager of research support services Rick Armstrong. support for research development, including proposal review, brokering partnerships, and identification of project funding sources.